4.1 As outlined in Chapter 3, the Parliamentary Budget Office's (PBO) submission provided a detailed state-by-state breakdown of the difference in Commonwealth hospital funding between the government's policy announced in the 2014‑15 Budget and the former government's hospital funding arrangements under the National Health Reform Agreement 2011. The government's 2014‑15 Budget marked a fundamental policy shift away from the previous government's activity based funding model, which established a national efficient price for hospital services. Instead, it reverts to the former block funding model based on CPI and population growth. 4.2 The PBO's figures show that New South Wales (NSW) will lose the most of any state or territory, with $17.6 billion in hospital funding lost over an eight year period due to the government's abandonment of the carefully negotiated national health agreement. The annual funding differences are set out in Appendix 4. Mr Baird said it was a “kick in the gut” for people in the state. “What services would (they) like us to cut here in NSW on the back of the funding cuts that we’ve seen overnight?” he asked. 4.4 The NSW Treasurer, the Hon Andrew Constance MP, estimated that to make up the loss from the 2014-15 Budget decision to scrap the NHRA, including the immediate cessation of several National Partnership Agreements, NSW would have to find an additional $1.2 billion over the next four years. This would happen over a period of time between 2017-18 and 2024-25. That is short enough that the effects will be felt keenly and immediately but long enough to be sufficiently insidious that the true cause would be masked by the political cycle. We could have chosen others, but Westmead is a large and well-known hospital that saw nearly 1½ million patients in 2014-15. It is a hospital in Western Sydney where the numbers of people with multiple chronic illnesses are growing and demand for hospital services is growing rapidly. It, like Blacktown, Bankstown and many other centres in Western Sydney, is seeing surges in patient numbers that are outpacing population growth. I personally live and work in Campbelltown and I see firsthand the impact of a system that is struggling to keep up with growth. After July 2017, it is the federal government's plan to link state health funding to population growth, even though it is demonstrably the case now that demand for health service is rising faster than the population. There is no reason to think that will not continue. ...the longer the uncertainty over funding continues, the worse the federal government is making it for hospitals. To plan for the health needs of a community the size of New South Wales, you need to be able to plan years in advance. The way things are currently, we have a public health system with a plan up until next year, really. Obviously it is not a problem unique to our state, but New South Wales has the highest population of any state in the country. Senator McLUCAS: Funding to drive the change, is that what you are talking about? Dr Pesce: Yes. If the priority is to save money, it is very hard to reform the system. Dr Sara: It becomes impossible. Essentially, the managers and doctors in those hospitals and districts go into further spiralling into a pit of despair. You would be unable to do any of the strategic planning stuff [workforce planning and infrastructure] that [Dr Andrew Pesce] has talked about; it just becomes a race to the bottom. That has been happening in South Australia over the last couple of years, and it is a nightmare. They are not looking at reconfiguration, they are just looking at slashing and burning. Then people start thinking about their jobs. They start thinking about which patients gets the care and which do not. Any rational basis for planning delivery of health services just goes out the door. Dr McDonald: I will tell you a story. I was phoned at 11 o'clock last night by the mother of a child who I had sent home that morning. She brought her back because I had given her my mobile number on the off chance that this child is not well, and it was not. She rang me in tears because she could not get a bed. There were two beds in that department which were not being used. They were not being used because the staff to open them had not been employed for the night shift. That is what happens if you cut money out of the budget. You shave staff, and people cannot get help when they need it. All this four-year-old child needed was a bed to lie down on—that was it. She did not even have a flat surface so she cuddled a mother in the waiting room even though she had only been sent home from hospital that morning and was not well. This is what happens if you cut funding on an individual patient basis. Dr Keat: ...If you do not have the nursing staff to open those beds, you get an overflow. There have been situations whereby we have had patients waiting in corridors for a bed on a ward or for a designated bed in a full bed ward. This particularly happens over the winter period. Planners try to anticipate for that and the hospital does try and anticipate for that but we have a turnover where a third of our presentations in emergency end up in a hospital bed; they need to be in a hospital bed. We have more rapid turnover beds than pretty much any other hospital in the state in the number of patients per bed. There are always points. There are better days but there are bad days. I get a text message from the executive saying: 'Please can review your [patients] for discharge.' It is not like we do not review our patients for discharge but the executive want it more urgently so there are circumstances where you go, 'Hold on, I might send that patient home a bit earlier even I am not completely comfortable because I need to get another patient in for another procedure.' In winter there are no beds for elective procedures. We have patients who need muscle biopsies to make a diagnosis for changes in treatment or for aggressive treatment we need to give but we need a bed for that because it needs anaesthetic but we cannot necessarily book that patient in for an elective procedure which would save hospital beds to a degree. We know if it is going to happen that day, we will bring the patient in that evening. The next morning they have the procedure and potentially go home the next evening. We cannot plan that well. We tell the patient we will give them a call if there is a bed available in maybe a week or two weeks. As it goes on, the patient becomes weaker or we cannot initiate the appropriate treatment in time and they may end up in hospital and a vicious cycle develops. Dr McDonald: We have 16 built rooms in our Outpatients, and we can open five. Dr Keat: Why?... Basically clinicians who are employed to be paediatric endocrinologists want to open a clinic and they cannot because they do not have clerical support for it. They are not allowed to. CHAIR: That is the back office, is it? Dr McDonald: You need somebody to greet the patient, to call Medicare, to get the notes out. Because we do not have clerical support, we have got a built Outpatients with 16 rooms, of which five are being used. CHAIR: This is a really important part of demythologising the language around the front-line staff and the backroom work. Dr McDonald: And the clerk is front-line staff. The cleaners are front-line. Dr Keat: They are. For example, in our Outpatients, there are issues with the hand sanitisers not being filled. Senator MOORE: The neurologists would not be doing that! Dr Keat: The neurologists would not be? Senator MOORE: No. They would not be filling that up. Dr McDonald: I pay to get my typing done, because I have got a medical duty of care. It costs me 50 bucks a week to get my typing done, but I am not going to put it through the system and have the letter arrive two weeks later, when I can pay 50 bucks to a lady in Narellan to get the typing of the hospital letters done. Dr McDonald: The annual hospitals budget, from New South Wales, is about $20 billion. That is one year's salary, effectively. The total Commonwealth spend on health is about nine-point-something per cent of the GDP, about $140 billion a year, so a cost of $56 billion must affect patient care. You cannot possibly cut that much and not affect patient care. CHAIR: Or we could stop doing anything for one whole year. Dr McDonald: You can close the system for a year or you can fund to meet demand. But that is, virtually, a year's budget. The last time I looked it was $18.3 billion so it is, virtually, a year's New South Wales hospital budget worth of cuts. The committee speaks to GPs, Medicare Local representatives, and health consumers at a public hearing in Penrith, Sydney on 12 March 2015. CHAIR: ...what is the impact currently on your work practices in the areas out of the city in the New South Wales, where particular medical problems are emerging, and, as a plea for those people, what needs to happen going forward? Prof. Frankum: You would be aware that I think seven of the 10 most disadvantaged suburbs in Australia—or New South Wales; I am not sure which—are in south-western and Western Sydney. Campbelltown has I think three of the most severely deprived suburbs in the state. The problem for those people is access to services generally, but also access to quality general practice and specialist services which are not always provided by the public system and are unaffordable for some people. Senator WILLIAMS: Is this in suburban Sydney? Senator WILLIAMS: You ought to go and live in a country or rural area like I have done all my life! Senator WILLIAMS: At least they can travel half an hour or so to get to specialists. Prof. Frankum: Many cannot afford to go to specialists. CHAIR: Exactly. They cannot afford the out-of-pockets. Prof. Frankum: The waiting lists, for example, at some of our public hospitals are enormous. I am an allergist and I do paediatric allergy as well as adults. Our waiting list to have a food challenge for a child who we are not sure is able to eat egg or milk or something, because of a previous allergy, is two years. So this kid is at risk of anaphylaxis if they do eat it and has to wait two years to find out if it is safe for them to eat it. If your child has a complex surgical problem, access to Westmead or Randwick children's hospitals is very problematic. There is good evidence that if you live in the poorer suburbs there is much less access to all of those services. That is what happens if funding does not continue to grow. I think we will get more sick patients if the primary health care is not attended to. I mentioned some patients, like asthma patients and patients with a chronic disease like emphysema, who have been better managed because there are good strategies and care plans in place for them. Any budget cuts in that area will only reflect to us getting them at a sicker state. There will be a higher burden on the presentations in the health system. On funding, I have gone from a situation in my health career of over 20 years of saying to people sitting in hospital, 'Ducky will be home soon; she's fine,' to seeing people like that shoved out the door a day or two early sometimes. I had a situation at the hospital the other night while I was the after-hours manager. We were chockers. We have people lining up in the ED. When I was handing over to the night manager, I said, 'I'm really sorry. We have only three beds left and these patients are going to need them,' and then the ward phoned up and said, 'Mr Jones has just died, so we have another bed.' That is the wrong attitude to have. I hate the situation we are in now where things are so tight that that is the sort of thing people are saying—'Yes, I can give this guy in the ED a bed, but a poor old 92-year-old has had to pass away for him to get it.' That is the reality of our world. Mr Wilson: ...Senator O'Neill, you mentioned something about the border crossings before. I have an example for you. There was a patient in Tweed Hospital. I cannot use names because of confidentiality. He was having a big gastric bleed. Instead of being transferred to the Gold Coast where they could have done something about it, he was transferred all the way down to Lismore in the back of an ambulance—with a doctor and a bag full of blood, just in case something happened. I raised this with the JCC, so this is on record there too. Senator McLUCAS: Where was he from? Mr Wilson: It was at Tweed Hospital. I do not know where he was actually from, but he came from Tweed Hospital. Gold Coast is where? Lismore is where? They put him in the ambulance. If you do not know about that situation, you can bleed out inside your stomach and have no external signs very quickly. What was a doctor in the back of an ambulance with a box full of blood going to do? That has been happening progressively since the change of government in Queensland—the blocking of the border—but that is nothing to do with this. 4.18 As the most populous states in Australia, NSW faces a crisis as a result of the Coalition Government's hospital funding cuts. By forcing the state government to scrape together funds year-to-year for hospital services, the Federal Government cuts make forward planning virtually impossible. Without the ability to invest with long‑term certainty in health-related infrastructure and training, state governments ability to make the hospital system more efficient is severely curtailed. 4.19 The committee believes that the New South Wales Government is not able to sustain the increased funding needed for adequate hospital services without adequate contributions from the Commonwealth. In NSW, the Commonwealth's planned funding reductions will have grown to a total of $17.6 billion by 2024-25, and could easily threaten to overwhelm the NSW State Budget. 4.20 Long-term funding certainty allows for better planning for infrastructure, managing staffing, waiting times and lists, and delivers increased efficiencies overall. When hospitals are forced to operate on year-to-year budgets, there is no capacity for planning ahead and making efficient investment in staff and services. 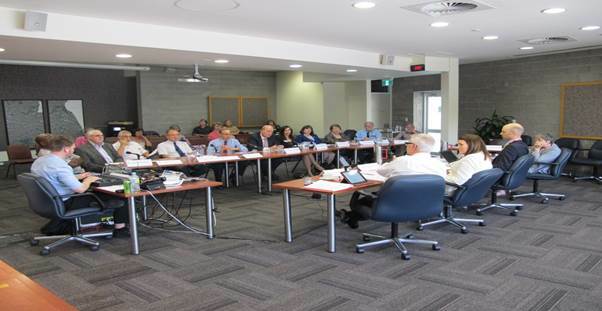 4.21 The committee believes that without long-term funding, state and territory public hospitals will not be able to achieve efficiencies and adequately serve their citizens. The committee calls on the Federal Government to create a long-term, sustainable, funding model for hospitals which allows for appropriate contributions from governments, both state and federal. 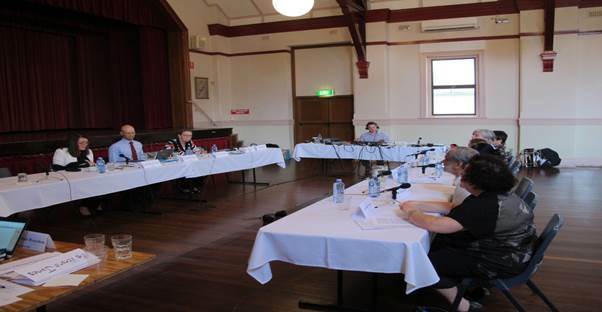 The committee speaks to a panel of GPs at a public hearing in Strathfield, Sydney, on 19 February 2015.